The birth injury attorneys at Reiter & Walsh ABC Law Centers obtained millions for a girl who has cerebral palsy caused by medical negligence. During labor, the baby’s umbilical cord was wrapped around her neck (nuchal cord), causing her to experience severe birth asphyxia (oxygen deprivation). The distressed baby’s delivery was delayed and the prolonged birth asphyxia caused her to have brain damage and seizures. She was diagnosed with spastic diplegia, a type of cerebral palsy that primarily affects the lower body. Cerebral palsy causes her to have very stiff muscles, making movement and balance a struggle. When Reiter & Walsh received the call from this young girl’s mother, Jesse Reiter and his team of award winning attorneys got to work right away, ordering all the child’s medical records so they could learn the extent of the brain injury, pinpoint the causes of the damage and understand how the cerebral palsy will affect the girl’s life now and into the future. The lawyers also spent a lot of time getting to know the little girl and her family so they could fully understand the child’s needs. Once Jesse’s team of birth injury attorneys fully understood the young girl’s injury and what caused it, they began to speak with the best medical experts and life care planners in the country. Enlisting the help of leading medical experts is critical in proving negligence. Life care planners help determine the cost of lifelong treatments, therapies, housing and educational needs. With their endless research on the girl’s negligent care and cerebral palsy, Reiter & Walsh’s attorneys got the hospital to settle with the family for millions of dollars. This will help the young girl to get all the treatments and therapies she needs for her cerebral palsy. It will also allow her to get the most advanced housing and educational assistance. 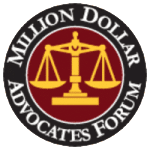 Many attorneys who describe themselves as being “medical malpractice” or “birth injury” attorneys actually refer the cases to other lawyers and then collect the fees. At Reiter & Walsh ABC Law Centers, the attorneys focus solely on birth injury cases and have a special understanding of the needs of the children and families they help. The firm’s birth injury attorneys take the time to get to know each child and family and are available around the clock to speak with them. The birth injury attorneys at Reiter & Walsh have helped dozens of children affected by cerebral palsy. 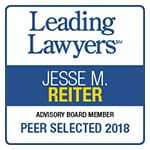 Jesse Reiter, president of ABC Law Centers, has been focusing on birth injury cases for over 28 years, and most of his cases involve cerebral palsy and hypoxic ischemic encephalopathy (HIE). Partners Jesse Reiter and Rebecca Walsh are currently recognized as being two of the best medical malpractice attorneys in America by U.S. News and World Report 2015, which also recognized ABC Law Centers as one of the best medical malpractice law firms in the nation. The attorneys at ABC Law Centers have won numerous awards for their advocacy of children and are members of the Birth Trauma Litigation Group (BTLG) and the Michigan Association for Justice (MAJ). If your child experienced a birth injury and now has seizures, hypoxic ischemic encephalopathy, brain damage, cerebral palsy or any other long-term condition, contact Reiter & Walsh today at 888-419-2229. Our birth injury attorneys give personal attention to each child and family they help and are available 24/7 to speak with you. It is important to note that physicians and medical staff rarely admit that negligence occurred. When parents ask if their child is okay, physicians sometimes tell them that it is too early to tell and they will have to wait and see. Or, when a birth injury is evident near the time of birth, physicians might tell parents that conditions such as birth asphyxia was just a complication of a standard procedure. If the mother in this case had listened to her baby’s doctors and waited until her child was older, she would not have gotten early intervention for her daughter, which is critical when a child has cerebral palsy and special needs. The mother in this case noticed that developmental milestones weren’t being met when her girl was still a baby and took the child to see a doctor right away. She then enlisted the help of the powerful birth injury attorneys at Reiter & Walsh so she could get help for her child’s lifelong needs. Of course, parents often do not notice problems in a child until the child is 4 or 5-years-old. Indeed, this is quite common. But it cannot be emphasized enough how important it is to begin treatment and therapy as early as possible in order to maximize treatment benefits. A birth injury is an injury with long-term consequences that a baby sustains during or near the time of birth. Often, the injury occurs during the process of labor and delivery. Sometimes, however, a birth injury can occur before birth, and it can be caused by negligent prenatal care, such as failing to diagnose a potentially harmful medical condition and/or failing to schedule early delivery of the baby. Birth injuries can also occur after birth, in the neonatal ICU. NICU birth injuries are frequently caused by failure to properly help a baby who has breathing problems or seizures, or failing to adequately treat jaundice or low blood sugar (hypoglycemia). The girl in this case had her umbilical cord wrapped around her neck (nuchal cord), which caused her to experience severe birth asphyxia. When birth asphyxia occurs, the baby’s heart tracings will be abnormal or nonreassuring. The medical team must then quickly deliver the baby – usually by emergency C-section – to minimize the birth asphyxia and prevent brain damage. If you are seeking the help of a birth injury attorney, it is very important to choose an attorney and firm that focus solely on birth injury cases. Reiter & Walsh ABC Law Centers is a national birth injury law firm that has been helping children with birth injuries for almost 3 decades. 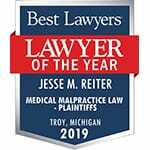 Birth injury attorney Jesse Reiter, president of ABC Law Centers, has been focusing solely on birth injury cases for over 28 years, and most of his cases involve hypoxic ischemic encephalopathy (HIE) and cerebral palsy. Partners Jesse Reiter and Rebecca Walsh are currently recognized as being two of the best medical malpractice lawyers in America by U.S. News and World Report 2015, which also recognized ABC Law Centers as being one of the best medical malpractice law firms in the nation. The lawyers at ABC Law Centers have won numerous awards for their advocacy of children and are members of the Birth Trauma Litigation Group (BTLG) and the Michigan Association for Justice (MAJ). In this video, birth injury attorneys Jesse Reiter and Rebecca Walsh discuss causes of birth asphyxia, such as the cord being wrapped around the baby’s neck (nuchal cord), and how this can cause cerebral palsy.